We realize when we want to check some web services which are from some popular businesses such as hosting services, we can use Twitter with the real time status. In this case, seems Twitter is the best choice. We only heard that there were strangers used other people’s emails to register on Twitter or hacked existing Twitter account to post some messages which were not from the Twitter owners themselves. Here we do not want to research why those kinds of issues were happened but we just want to know how to handle this issue. Because, we are meeting the same issue now. Let’s record what we are trying to do now. All websites keep updating every year. Here is the process of registering to Twitter in 2016. Twitter is an online social networking service that enables users to send and read short 140-character messages called “tweets”. Registered users can read and post tweets, but those who are unregistered can only read them. Users access Twitter through the website interface, SMS or mobile device app. Twitter Inc. is based in San Francisco and has more than 25 offices around the world. Today Chinese No. 1 Micro Blog Site: Weibo.com announced pausing comment function for a short time. They said they need to clean up rumors, and some illegal and harmful information. Recently, micro-blog comment threads more rumors in illegal or harmful information. Centralized cleanup from March 31 to April 3, suspension of micro-blog comments. After the cleanup, we will open the comments function. For necessary information for cleaning, is an Exchange environment in order to help serve you better, we hope that the user understanding and understanding. Thank you for your support. Weibo.com is the Biggest micro blog site in China, just like Twitter, but due to some reporters Weibo.com is more huge than Twitter actually since it has much more registered members. Twitter is over capacity ? This is so weird! 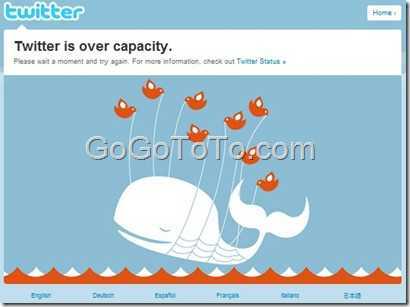 We never thought a big site like Twitter can be over capacity ? Or it is really there are too many Twitter visitors in this world ? Is it a good thing or bad thing for Twitter ? we can follow Twitter Status page to get more detail information. Twitter bought the domain t.co for its short domain name. Twitter uses the t.co domain as part of a service to protect users from harmful activity, to provide value for the developer ecosystem, and as a quality signal for surfacing relevant, interesting Tweets. T.co reported that it has already brought huge visiting traffic for Twitter since it was launched. If you often use Twitter, you might complain why Twitter could not upload an image from your computer. Maybe some users just like me, we did not know how to upload an image ? Actually I double checked, I really did not see a function or any menu which let me upload or share images on Twitter. You know, there are many other Twitter-like mini blog system have provided the image uploading feature, such as Chinese twitter – weibo.com. Chinese has already used image uploading and sharing for long time. Share an image on Twitter ? Yes, finally, Twitter provides this function now! We can upload an image to our Twitter account now, we can share images now. 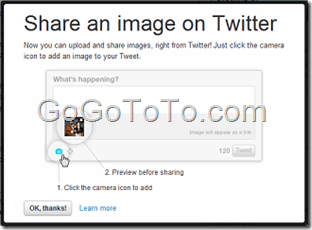 When you click the Tweet box, you will see there is a new icons under the box: a camera icon, which provides the function of uploading an image from your computer. You can see the line of words: Image will appear as a link. That is upset news: You can share and upload your images, but when you uploaded, the image ONLY show as a link, not a thumb image just like weibo.com. About more detail information, please read Twitter help page. You might have a long website URL to want to share with your friend, the popular sharing methods are email, IM, and also the most popular tools Twitter, Facebook, and you might use your cell phone. So, you have a trouble now: your URL link is too long for sharing: The long link always get broken when you post in your email or IM, and also we don’t think you can post it on Twitter directly since Twitter only allow 140 characters length. So Is it possible to be shorter ? 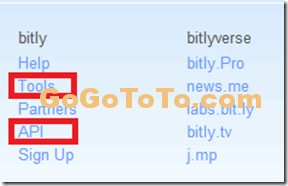 TinyURL is the one of earlier shorten link services providers. Before all Twitter’s shorter links used TinyURL service. Goo.gl is Google’s shorten service, function is the same as above 2, but Bit.ly provides much more features. Google URL Shortener at goo.gl is used by Google products to create short URLs that can be easily shared, tweeted, or emailed to friends. By the way, a Chinese Twitter-like site. which belongs Sina China, named Weibo.com, they own the shortest domain name in the world: T.CN, and also they are using t.cn for their own shorten link service. but they are not a Shorten service provider. The search bar is moved to left side and its place indicates that the searching is most important because it is now the “center” place of home page; Register is now expanded and simple: input your Fullname, Email, Password and then sign up. Reported by the Wall Street Journal on Thursday: Google and Facebook are trying to buy Twitter . Twitter has continued to grow, in terms of reach, usability and social impact. Google wants total access to Twitter’s data so it can make real-time information an integrated part of its offering and not just an add-on. Since 2009 the search giant has been indexing Twitter users’ tweets to add a real-time element to its search experience. Eighteen months on from that non-exclusive deal, Google has yet to create its own version of real-time search. And similarly, Facebook, which was rumoured to have been interested in buying Twitter two years ago, would benefit massively from full access to Twitter’s rich data hose, in its bid to become the social web, within the web. What Cloud Computing and Data Center will Be Finally ?